Share: Art a GoGo Podcast #58 - Where is Ai Weiwei? 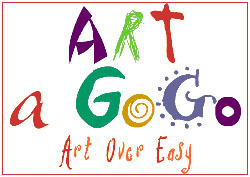 Share: Art a GoGo Podcast #49 - Huh? I just don't get it! Share: Art a GoGo Podcast #45 - Is starving a dog art? Is it art if the artist is an orangutan? Share: Art a GoGo Podcast #43 - LACMA, MFA Mobile, "Shibboleth"
Share: Art a GoGo Podcast #42 - New show format..Art Shot is here! Share: Art a GoGo Podcast #37 - Back from Hiatus! Share: Art a GoGo Podcast #33 - Happy Holidays + The Year in Review! Back to basicsâ€¦All Art News today! The story has caught the imagination of Hollywood, with no less than two movies in the works. Michael Douglasâ€™ film titled Art Con is currently in development. It was also announced last week that producers Jay Weston and Fred Levinson had purchased the rights to do a John Myatt biopic, which may start filiming by the end of the year. Share: Art a GoGo Podcast #14 - Back in Santa Cruz! Share: Art a GoGo Podcast #12 - AAG on Tour in Glasgow, Scotland! Share: Art a GoGo Podcast #9 - AAG on Tour in London!